I was very excited that my first Daring Baker's Challenge was something I've never made before - cheesecake! This was a great first challenge for me, somewhat simple and endless possibilities. I went back and forth a little bit on what flavor to choose - whether to keep it simple and just stick with a plain cheesecake, or to step it up and go all out. I think what I finally decided on falls somewhere in the middle of the two. I took things slow and made the graham crackers in advance. They turned out great and the first thing a taste tester of mine said after trying one was, "This would be great as a pie crust." Win! 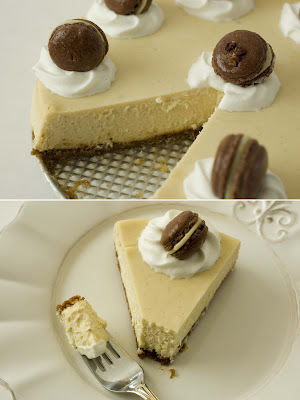 I ended up baking my cheesecake just this past weekend - it's been a busy month! I had wanted to make it a few weekends ago after I got my wisdom teeth out, but I was much more lazy than I had expected to be that weekend (and heavily drugged, I might add lol). So I had a very busy weekend of baking. The cheesecake itself was very simple and easy to make. Everything came together quickly and after having done my research on cheesecake making, I decided I would add one tablespoon of cornstarch to the batter to prevent any cracking. While a crack isn't going to make it taste any different (and is easily covered up) I'm very picky about that sort of thing, so I decided to take that added insurance. The only hang up I had was using a spring form pan. While the idea of the pan leaking while in the water bath worried me, I was apprehensive at the thought of flipping a cheesecake out of a pan without removable sides. I decided to go with the spring form and hope for the best. I carefully wrapped that sucker three times with foil, but alas, the water still found it's way in! I found just a little bit of water in each layer of foil, but couldn't tell if it actually seeped through the pan itself. Only the first slice would tell, but I had to let it cool first. As the cheesecake was cooling, I made the the macarons - I chose chocolate, which are my favorite. 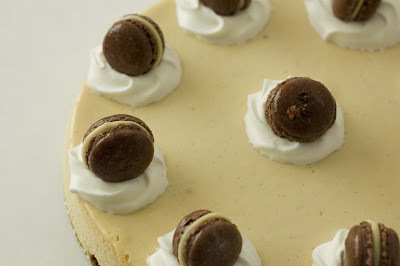 I use this recipe from Canelle et Vanille which has never failed for me...until this weekend. I haven't made macarons in a few weeks, so I felt a little rusty. Always attempting to avoid a macaron disaster, I ended up being too careful in mixing the batter and I think I under-mixed it. They looked so pretty as they were drying, but once they were half way through the baking time, they had already begun to crack. Unfortunately two trays of failures! I was quite discouraged, as this has been my go to recipe, never a failure, always a beautiful result. I took a break and decided to resume the next day with another batch of macarons. The next batch I decided to make some mini macarons along with the regular sized ones (regular size being about and inch a half in diameter). The batter looked much better this time, so I was optimistic. I sprinkled the regular sized macarons with one of the three: raw cacao nibs, fleur de sel or cocoa powder, and left the mini ones plain. This time, almost all the regular sized macarons cracked - I got maybe half a dozen that didn't - and all the mini ones came out perfectly! Confuzzled, I didn't have much time to ponder what went wrong and carried on. I had enough of the mini macarons to use as decoration and filled them with an Irish cream white chocolate ganache. Yummy! For the final assembly, I made some whipped cream and sweetened it with vanilla sugar. 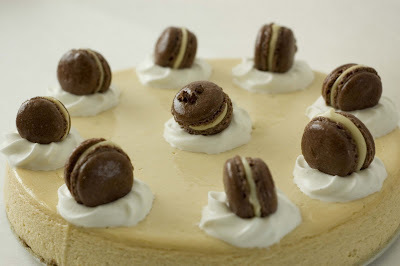 I piped some rosettes on the cheesecake and topped those with the macarons. Challenge complete! So how did it taste? It turned out incredibly declicous! The crust showed no evidence of sogginess and went perfectly with the creamy texture of the cake. You can really taste the Irish cream and the tiny flecks of vanilla bean add even more the the visual appeal. I am very pleased with my first cheesecake and can defnitely see myself making this again. I would love to try out more flavor combinations and even making mini cheesecakes too. Thanks Jenny for the great recipe! 3. 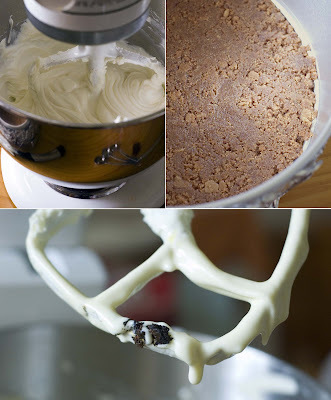 Combine cream cheese and sugar and cornstarch in the bowl of a stand-mixer (or in a large bowl if using a hand-mixer) and cream together until smooth. Add eggs, one at a time, fully incorporating each before adding the next. Make sure to scrape down the bowl in between each egg. Add heavy cream, vanilla, lemon juice, and alcohol and blend until smooth and creamy. So pretty with the macarons on top. Great job on your first challenge! Welcome to daring bakers! Your cheesecake is lovely. Great job on this month's challenge. Wow, I'm truly impressed! Combining cheesecake and macarons... Decadent! I've always wanted to try making macarons but have been too scared. You've pulled both desserts off beautifully! Beautiful! 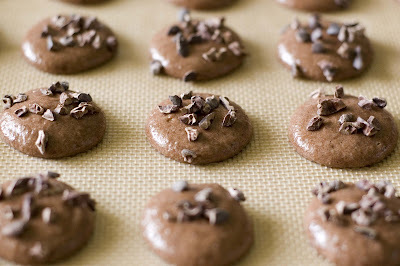 I've never made macaroons, but they are so pretty...I'm going to have to get to it soon. Absolutely amazing and I can't believe that this is your first challenge. Well done! Beautiful! The cheesecake looks so wonderful. Great job. Very well presented. Wish i could have a slice! Good job! 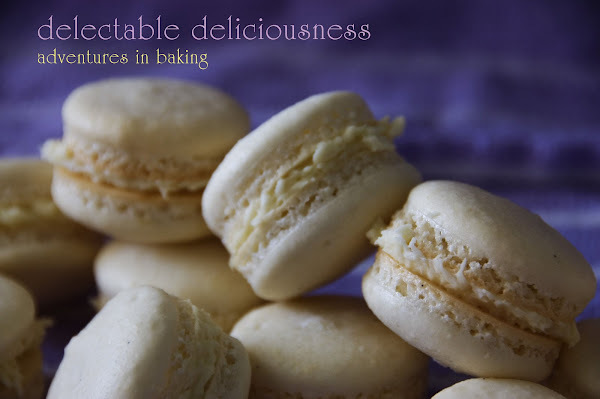 I love your little macarons they're so adorable, Vanilla and Irish Cream mmmm mmmm mmmm absolutely decadent combination! Your cheesecake looks so adorable (and more importantly, tasty)! Love it! I love that on top of cheesecake you also made macarons! It looks beautiful and delicious! Welcome to DB! The mini macaroons make it look so beautiful. I commend you for making your own graham crackers, very impressive. Thanks for being a part of the April Daring Baker's Challenge! My cheesecakes always do what you described--water in the foil but not in the cake. It makes me think maybe it all just depends on using a good springform pan. Your cake is simply beautiful. I can tell you have a lot of patience! I love the mini macaroon decoration! So adorable. Looks like a fantastic start with the Daring Bakers.